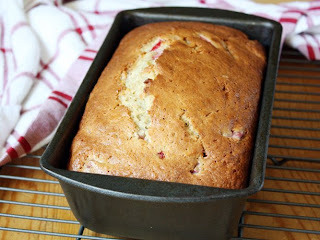 Check out this recipe for "Strawberry-Brown Butter Banana Bread". Heat oven to 350°F. Grease or spray bottom only of 9x5-inch loaf pan. In 1-quart saucepan, heat butter over medium heat, stirring occasionally, until golden brown. Remove from heat; pour through strainer into small bowl to remove blackened bits. Add bananas, buttermilk and vanilla; stir until smooth. Add flour, baking soda and salt; stir until just combined. Fold in strawberries. Pour into pan. Cool in pan 10 minutes. Remove from pan to cooling rack. Cool completely before slicing. Add 1/2 cup chopped pecans or walnuts to batter for extra crunch. Don’t have buttermilk? Mix 1 1/2 teaspoons lemon juice with regular milk to make 1/2 cup to achieve the same tangy flavor of real buttermilk.